Just picture getting up in the morning and skipping to work at a place that is wholly dedicated to transforming people’s lives and improving our environment. That’s us – mostly. Not everyone skips in every day, but pulling together towards a common goal helps us all to get through the dark winter days and the occasional dull task. And there’s always wood to play with. We love the smell of timber and freshly cut wood and find it strangely therapeutic. Would you like to join us in trying to make the world a better and happier place? The routes to joining OWR are two-fold. We regularly advertise job vacancies on this page and post volunteering and work experience opportunities. 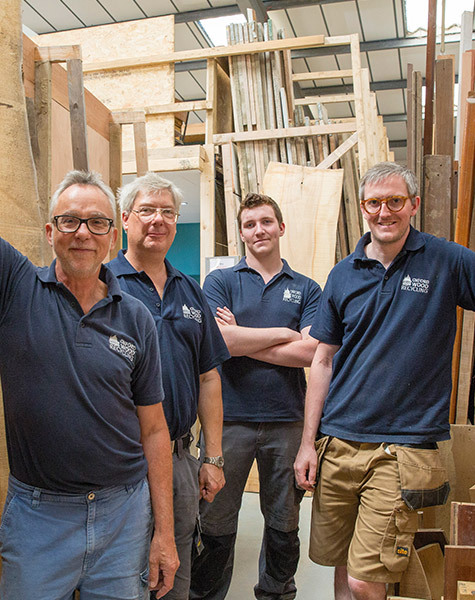 We’re focussed day to day on running a wood recycling service and operating a trade outlet for reclaimed timber. There are many activities within these work areas and as the enterprise develops there are often opportunities for people with diverse skills and experience. We especially seek to support people towards employment who face barriers to working due to managing their health or a disability, and take referrals from partner organisations specialising in mental health, homelessness, disability, social justice and refugees. However, we welcome applications for volunteering or job roles from everyone. For more details on what we do and why see our ‘who we are‘ page. Our volunteers tell us why they come to Oxford Wood Recycling. “ I enjoy working with wood and want to support OWR because I believe in what they are trying to achieve. “ Simon. “ I’m hoping to get a bit more experience before applying for a job” Paul. “I’m doing my year in industry with OWR” Liam. Furniture design student. “ This is a great step forward towards regular working after being ill for quite a while”. Gary.